Ages 11 - 16. A recipe inspired by the annual 25th of December Round the World Race at the South Pole, easy to make. 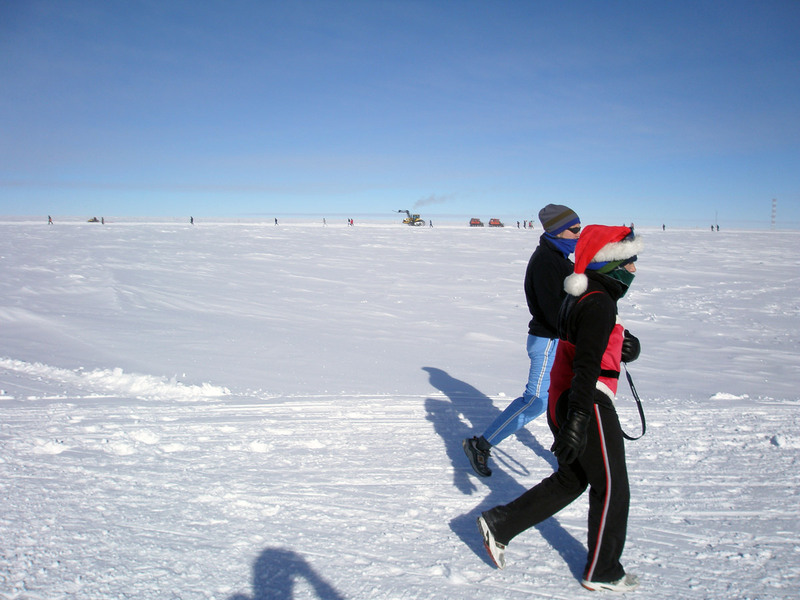 Every year on Christmas Day at the Amundsen-Scott South Pole scientific research station Antarctica there is a tradition of a "Race Around the World". The distance to be covered is 3 laps around the world through every line of longitude, which because this is at the South Pole only comes to about 2 miles total. Walkers, runners, and every sort of conveyance and fancy dress allowed. Christmas in Antarctica comes in the middle of summer, so there is 24 hours of daylight and a pretty good chance of getting blue skies and cold weather, the average temperature for December at the South Pole is -27.5°C (-17.5°F). The Race Around the World, the people and vehicles in the distance are right over at the other side of the world, 180 degrees of longitude away. "Recipe" is pushing it a bit to be honest, it's more of just a list of ingredients put together with no cooking ability involved, though that may be a good thing. Straw and flag to denote the South Pole in the middle of the next ingredient. 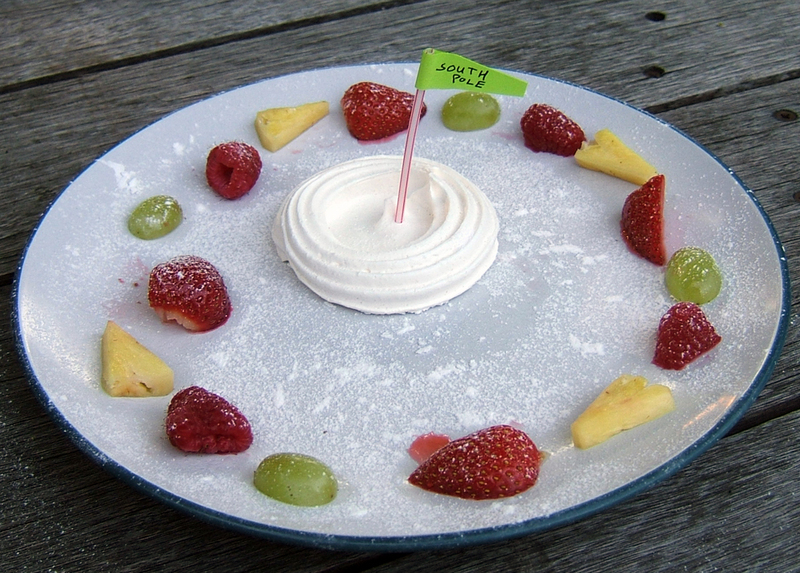 Meringue base, I bought a box of 8 from the supermarket for not a lot, you could make your own of course. Cut them into pieces that look like they are pointing in the same direction and racing around the South Pole marker. If you're feeling adventurous you could name them, or make little vehicles too. 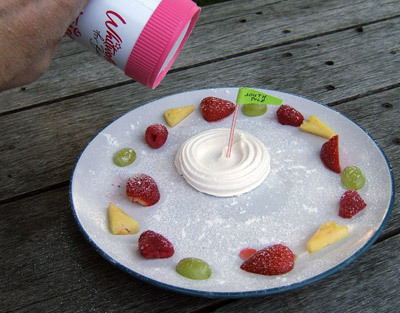 Icing sugar, I bought it in a shaker for about 4 times as much as a bag of plain icing sugar. I did this to avoid hunting in the corner cupboard in the kitchen for the sieve I am 50% certain we have. Use it as snow - obviously. Double cream, to go in the middle of the meringue base, I like double cream, less delicious alternatives are available. You could whip it and carve it into sastrugi, low lying wind sculptured snow ridges that lie parallel with the direction of the wind. Plate to put it on, I imagine this would look very odd unless it was a plain white plate. I like the simplicity of this and also the complexity of the underlying idea. Why is it a round the world race? 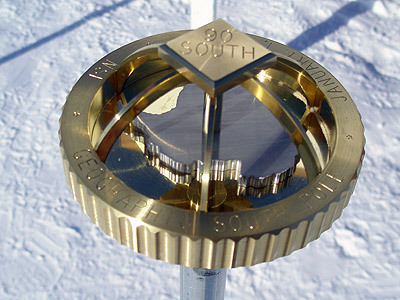 - this addresses ideas of the way the world is and the position of the South Pole on it. How can you run around the world three times while only going 2 miles? Why is there a base at the bottom of the world? What must it be like to live there?